Join the nail biting quest of a lifetime, which is packed full with an all-new, innovative and exciting motion comic and unique collectible cards, on 3D Blu-ray Deluxe Edition December 17 and Digital HD™ December 3. 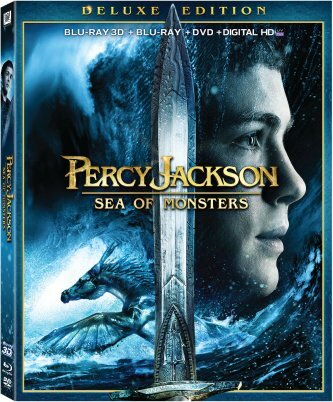 The magical, mythical adventures of the brave teenager Percy Jackson, who is the son of the Greek god Poseidon, will now continue in this heroic, action-packed thrill ride of a lifetime! Percy Jackson is out to prove he is not just a “one-quest wonder,” as some have called him. Percy and his equally amazing demigod friends all embark on a once in a lifetime and epic, cross-country journey into the treacherous Sea of Monsters, where they battle terrifying creatures, an army of zombies, and the ultimate evil. With time running out, Percy must find and bring home the fabled Golden Fleece, which has the power to save his world…and save us all!